Our binoculars range calculator can be used with every binoculars that have a reticle superimposed upon the view. With this scale, you can estimate the distance to an object the height of which you know. In the following text, we have explained how you can gain such useful knowledge. Read on if you want to learn more about binoculars definition and principles. Do you see a distant object over the horizon with your binoculars? With our Earth curvature calculator, you can find the height of an object that is partially hidden behind the horizon. Binoculars consist of two telescopes which are mounted side-by-side and aligned in the same direction. Because the observer uses two eyes, the binoculars give him the opportunity to see a three-dimensional image (with a depth of view). The first binoculars were invented in the 17th century, and they used the optics of Galileo, i.e., two lenses: convex objective and a concave eyepiece lens. Check our thin lens equation calculator or lens maker calculator to learn more about the role of the lenses in optics. Mil is the angular height of the object expressed in mrad. You can use the reticle (look at image below) in your binoculars to estimate the distance to the observed object. For example, if the height of the house h = 6m seen by the binoculars is Mil = 1 mrad, it means that the house is d = 6000 m away from you. All you need is to know the height of the object. travel time - this is probably the most natural way to determine the distance. It doesn't matter how far it is to the river - the important thing is that we'll be there in 10 minutes. 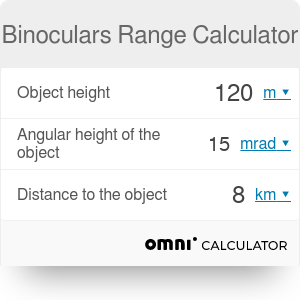 binoculars - we have explained how to do it with this binoculars range calculator. Binoculars Range Calculator can be embedded on your website to enrich the content you wrote and make it easier for your visitors to understand your message.